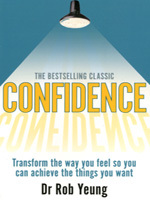 Confidence: Transform the Way You Feel So You Can Achieve the Things You Want, 3rd UK ed. This book will transform your life. With confidence you can succeed at just about anything! In your handsis themost definitive and indispensable guide to feeling, acting, and being more confident, that you’re ever likely to read. Using only the best methods, and the most effective techniques you’ll be equipped and empowered to achieve all your goals and will quickly build a profound and lasting belief in your abilities. There’s no psychobabble, no confusing jargon and no demanding and unrealistic expectations. Just quick and brilliant ‘Dos’ and ‘Don’ts’ that get you right to the heart of what you need to know and do to boost your confidence – now!